Although Mayor Bill de Blasio announced last year new mandates to force building owners to reduce greenhouse gas emissions as a way to fight climate change, a Dallas-based architecture firm has taken the idea of sustainable design to the next level. 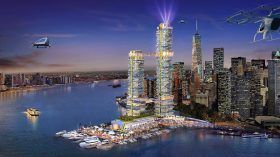 During last month’s International Builder’s Show, Humphreys & Partners presented a conceptual plan for a mixed-use project on Manhattan’s waterfront. 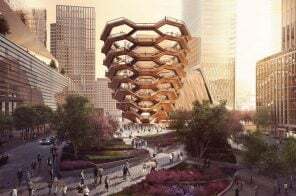 In Pier 2: Apartment of the Future, the architects tackled major issues prevalent in many cities, like affordability and energy efficiency (h/t Curbed NY). 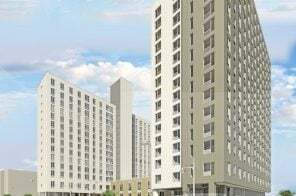 The futuristic proposal includes two towers with modular and micro-units, which would boast futuristic amenities like artificial intelligence, drones, home automation and more.